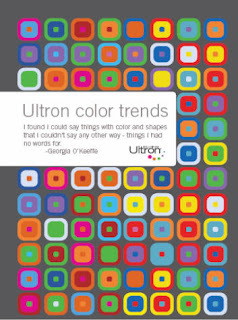 For background on these fascinating designer events, read Ultron Color Trends - Designer Workshops. You see, Ultron carpet fiber brought together seasoned designers in a first-ever series of four workshops to discuss color trends. 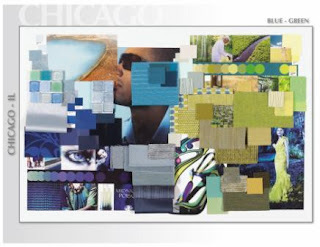 The events took place in 2008 over an eight week period in four cities around the country: Los Angeles, Seattle, Chicago and New York. 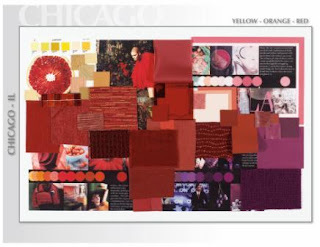 Eight to 12 designers were invited to each event and asked to bring inspiring color chips, samples, magazine articles, photos and swatches. Ann Hurley acted as facilitator and guide for the sessions. This brown, a neutral, nature inspired color, is versatile and sophisticated. Various shades of this color will work as a strong neutral base for any palette and can be used on large surfaces – floors, walls. It’s clean and simple, and when used with stronger neutrals, the look is rich and sophisticated. It could be used on large areas – walls as well as upholstery, and window treatments. What could be more attractive than the color of Earth itself? We’re always looking for that perfect dark brown: not too red, not too dull….. The smooth warm tone of this brown is a perfect compliment to any blue or red or neutral. 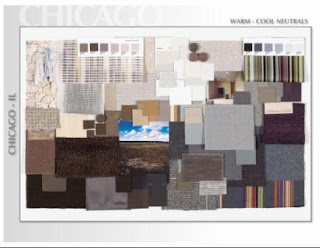 Warm neutrals with texture help evoke a feeling of hospitality or home; they bring warmth to a space. These colors can be used as a base or provide an accent when used with lighter colors. Fashion influenced this color direction for the brown family. Warm neutral greys are used with a splash of bright color (e.g., gold) creating an interesting balance of light and dark. Warm neutrals set a back drop or create the environment/surroundings to allow other elements to come through and be the focus. Tortoise Shell. Coco Bean/Rich soil/bronze. White will remain “hot” as a major influence of room color and product materials, but will be warmer to avoid the stark retail look of the past few years. “Graphite” is the new "Chocolate.” It will be used as an accent and blends well with the retro-grey washed woods that are becoming popular. With 80s retro becoming popular, a cool grey mid-tone will come back as a complement to white dove, graphite and currant red palette that was popular in the 80s but warmed up for the ‘08s. Layer of neutrals-tone on tone variations (underlying palette in most schemes). Water colors. The color of froth at the end of a wave - effervescent - fresh & clean. Aqua in glass accents, where the intensity varies by region and is influenced by water. This yellow green color is a nature inspired neutral color. It would work well as an accent on upholstery, window treatments or accent walls (also an accent end in carpet). This nature inspired neutral could be an alternative to rich greens, but can also be used with rich browns and burnt oranges. Sophisticated and universally appealing, it’s clean and simple, and when used with stronger neutrals, the look is rich. It could be used on large areas such as walls, as well as upholstery and window treatments. Fashion has often led the way for the color and texture of interiors. It's certainly setting the stage with this vibrant yellow – green midst dusky hues of the forest trail. These colors are also seen in the whimsical art-nouveau T-strap shoes, again painting with the vibrant colors of nature. Biomimicry – Nature influences design and color choices. This vibrant green color adds a pop of color or accent to any space. Green signifies growth, renewal, health and environment. It could be used in combination with almost any neutral color. These red colors are intense, and enhanced by the richer wood colors. They would work as a strong accent color in conjunction with rich browns for upholstery, window treatments or small accent walls. With eco-friendly fervor spreading across the nation in every market sector, everyone is finally getting on the sustainability band wagon. People are realizing that they are going to have to step-up and join in the green movement or they are going to be left behind. It’s affecting our decisions daily. This red color is based on nature’s vibrancy; a bright and natural color that has energy and confidence. The bright orange-red color of a blood orange relating to the color of the hibiscus in the background is the new eco-red and it’s “sustainably stylish”. Red is always popular but will move away from the orange hues and into berry tones. A trend from fashion is a dark navy and dark plum with a black tint. Next, the findings from the New York workshop.